SBS, characteristic shape of bill visible. So sad if the human-made World isn’t large enough to accomodate such a special little thing. Truth be told I didn’t travel to the other side of Earth to see the SBS – rare bird or not. On the other hand we wouldn’t have been there if it hadn’t been for that charismatic little bird – the work we did put in was to a large degree related to it, and I suspect we wouldn’t even have gained permissions to visit Chukotka if it hadn’t been for the SBS. As I have written elsewhere, the outlook for the SBS is not exactly promising, and that is really sad in many ways, not least because it is testimony to the fact that the habitats which it favours on its migration are being destroyed on a large scale. 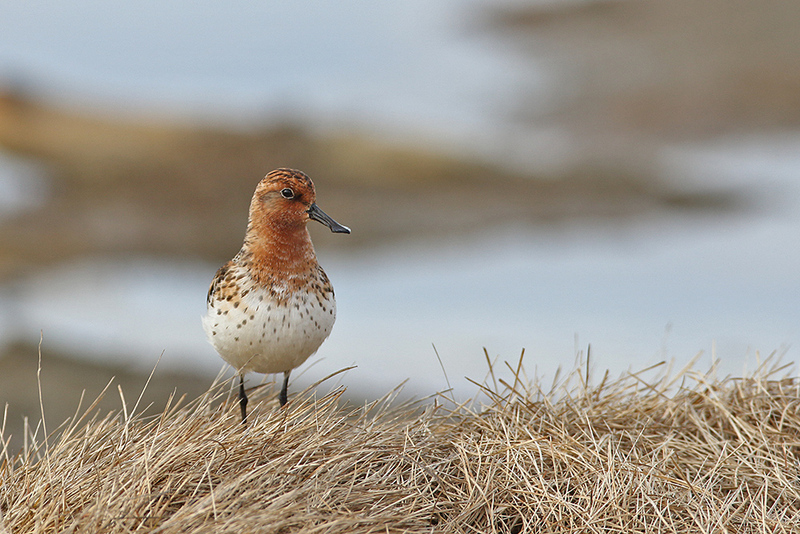 That is bad news for many other species, and true enough, most Arctic wader populations are in sharp decline. The others were just more numerous to start with, so aren’t all “critically endangered” just yet. There is much more SBS knowledge on the official website: http://www.saving-spoon-billed-sandpiper.com/ in the mean time here are some more SBS images from my camera. Remember to click on the first one to open up the gallery, and if you’re viewing on a PC you may want to hit f11 to get the full-screen experience. As usual I am happy when people take the time to post a comment or a question, so if there’s something you were wondering please shoot! The facial shot reveals something I believe to be significant for this bird – it has binary vision around the tip of its bill. Most waders have very little binary vision because their eyes are set exactly across from each other, to cover each their 180 degrees (and discover predators that way). These waders use their super-sensitive bills to locate food in the muck, but I believe SBS’s use vision to see the bugs before they grab them. Talk about a bird with an attitude! The angle, light and background are sub-optimal. But the posture and the reflection are pretty cool. In between he goes foraging – or maybe this is the missus? In this shot, the handsome little guy is doing his best to impress the little lady.